I’ll be the first to extol the virtues of nylon; it’s lightweight, extremely durable and cheap. It comprises the vast majority of travel bags. It also has no soul or character. Sometimes, dear readers, you just need a big, manly and rugged hold all. Not because you should or because it makes sense..but because you can. 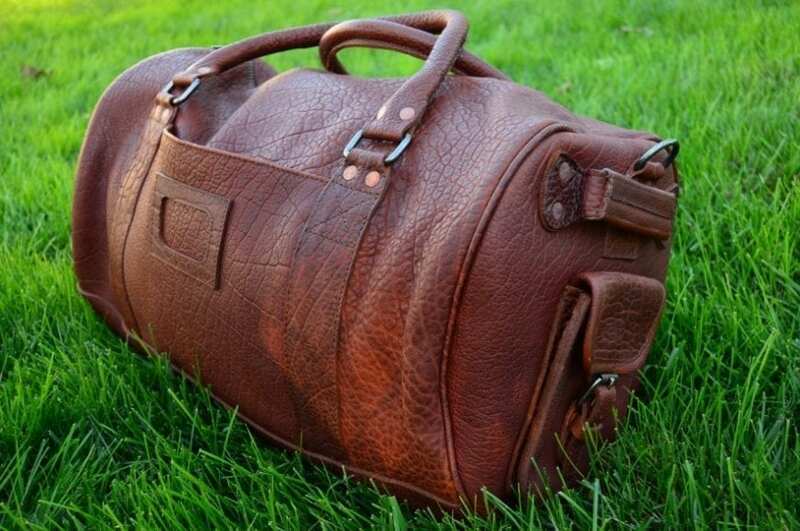 Enter the Buffalo Jackson Ryder Reserve Bison Leather Duffle. 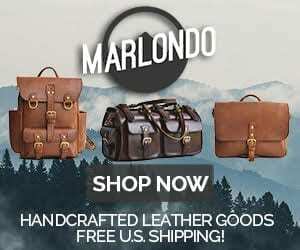 Now, what sets this bag apart from most of the items we review is that it’s made from Bison and not cowhide. Bison hides have distinctive wrinkles and striations due to their less domesticated nature. The Ryder Reserve features full grain bison leather. This leather is remarkably supple and pliable, there’s virtually no need for breaking it in. Copper rivets are used at all critical stress point areas as well as hefty stitching. The interior of the bag is lined with soft canvas and has two slotted pockets at either end with a large zippered pouch as well. The exterior has a slotted sleeve and buckled pouches on the ends. There are plenty of handles on this bag, you can briefcase carry, shoulder carry or even sling it over your back and carry from the end handles. All hardware is antique nickel including the bottom studs. Those studs at the bottom are a nice feature to have, and you can tell Buffalo Jackson thought this out and just didn’t add metal bling wherever the eyes could see. Make no mistake, the Ryder Reserve is a large bag. With enough space for everything but the kitchen sink. My wife and daughter recently were out of a town for the weekend. I tried a little experiment and instead of us all packing a bag, we fit it all in the Ryder. It all fit, we just used little plastic bags to divide our contents. It really made for a more pleasurable outing since we all weren’t toting bags. However, the bag was very heavy. The Ryder is just under 10 lbs empty. The shoulder strap definitely helps with the load though. The outside slotted sleeve was great for quick access to items like tablets and phones. The side pockets feature a buckle, great for securing more sensitive belongings. In a crowded place, such as a airport or subway, a thief can unzip a bag without detection pretty easily, but a buckle? No way! The interior zippered pocket is handy for smaller items you don’t want floating around. This bag really stands out. It’s funny, but the compliments almost get tedious after awhile. The Bison leather exudes a very masculine vibe that seems lost in another era. The antique nickel hardware gives the bag that polished feel and really completes the look. I appreciate the way the supple leather conforms to its surroundings. Taking a long look at the Ryder Reserve, and I can’t really think of anything that could be changed. I’m not saying it’s perfect, but I find it well balanced in its manufacture. Definition of a hold all bag, if you can’t get it all in here – you’re probably packing too much! After spending some quality time with the Ryder Reserve Bison Leather Duffle, I can draw out some main takeaways. This bag isn’t always the best option when you need to travel light and quick. When you’re taking your time and enjoying the trip however, this bag absolutely shines. With the almost overdone construction, I can imagine one day my future great grandchildren finding the Ryder in a dusty attic and using it, and the bag wouldn’t miss a beat.